This small bulb is really worth growing, as it flowers at a time when new colour is most welcome, i.e. September / October. It has fine green leaves 20 - 30 cm., and stems 15cm. 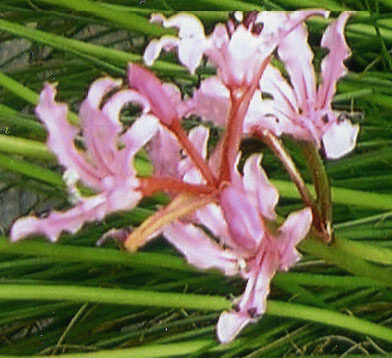 or more, with pink petals with wavy margins. 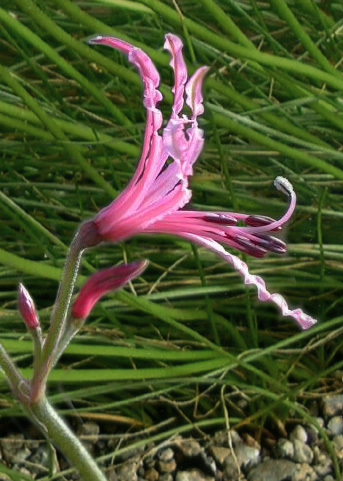 Nerine filifolia is native to the Eastern Cape, Free State, and Mpumalanga in South Africa as well as Swaziland, where it occurs widely in various spots, always between rock slabs or in shallow soil overlaying rock. 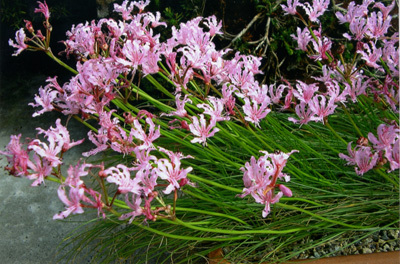 This nerine is considered half-hardy; however, after growing it in a pot and keeping it outside for the summers and in the greenhouse over winter, it had increased sufficiently after several years that I decided to try a few bulbs in a scree bed outside all year. It probably doesn't prove anything much, but for the last three years it has survived and bloomed nearly as well as the pampered version! Perhaps this cold winter that we are promised will put an end to the trial! This is an excellent and easy addition to our garden, and it is what John McWhirter would have called 'a well behaved plant'. It certainly gives me great pleasure.